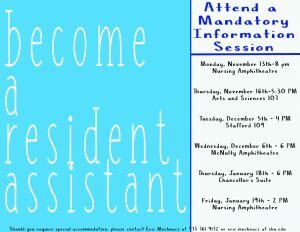 Become a Resident Assistant for 2018-2019! 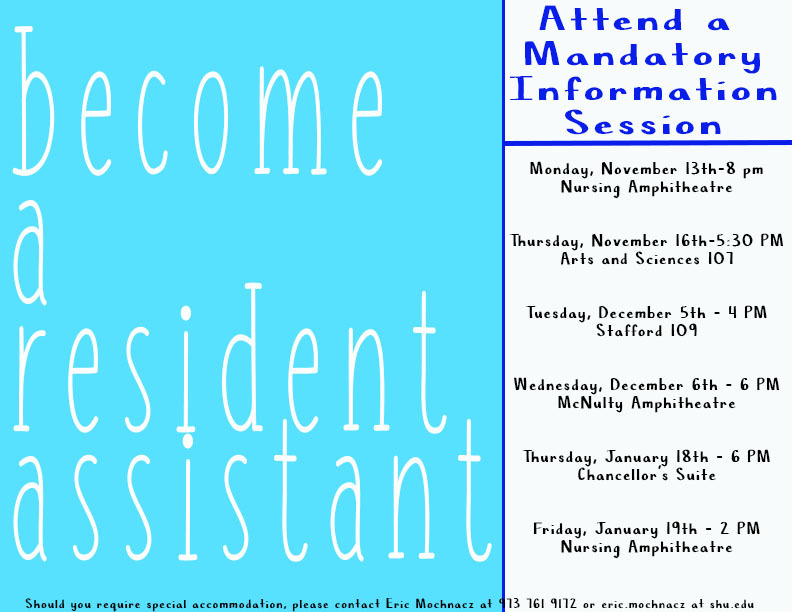 Housing and Residence Life is hosting 5 more Information Sessions for students interested in becoming Resident Assistants for the 2018-2019 academic year. Resident Assistants are student leaders who live in the residence halls to support the students on their floor and throughout the building. They offer programs to students to keep them engaged at Seton Hall. They serve on an overnight and weekend duty rotation to be available to students who need assistance or to address potential policy violations. RAs are supervised by the live-in professional staff (RHDs and RCs) and are provided supervision and professional development throughout the year. Housing and Residence Life anticipates approximately 25 vacancies on our 62 member staff. Resident Assistants receive free room and board and free training as compensation for the position. If a student is interested, they should attend 1 of the 5 remaining information sessions listed below. If you have any questions, do not hesitate to reach out to Assistant Director Eric Mochnacz at eric.mochnacz@shu.edu or Residence Coordinator Shamil Henriquez at shamil.henriquez@shu.edu. Next Next post: Meet Teresa and Ryan, November’s Featured RA’s!